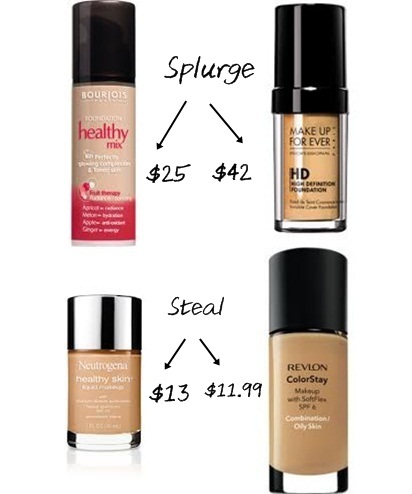 Splurge vs Steal, a small series that I want to make it a regular around here. I try my fair share of mid, high-end and drugstore products so there's always something I stumble across for half the price of what you pay at a department store that is just as good, if not better. Let's kick off the series with Primers, Tinted Moisturizers and Foundations! As someone with dry skin, I look for primers with a gel-creme consistency. Something more hydrating, but also something that takes care of my large pores and creates a good canvas for makeup. Some of my favourite from the pricier side of the spectrum include the Korres Pomegranate Mattifying Primer and the Tarte Clean Slate Flawless 12-hr Brightening Primer. A really good alternative is the Rimmel Fix and Perfect Pro Primer. It has a lovely consistency and works just as well! I reach out to the Rimmel a lot and haven't had any reactions to it. A real steal for the price I'd say! Now, foundation is not something I wear a lot. I lean more towards the tinted moisturizers and BB creams. But, a couple of foundations I absolutely love are the Bourjous Healthy Mix and the Make Up For Ever HD foundations. Bourjois is slightly more sheer than the medium-full coverage MUFE HD. A couple of good picks from the drugstore include the Neutrogena Healthy Skin for sheer coverage and the Revlon Colorstay for medium-full coverage. That being said, I would rather spend quite a few dollars more on a pricier foundation as drugstores make it really difficult to get your perfect shade matched. If you live in the US, check ASOS.com for availability of Bourjois from time to time! As far as tinted moisturizers go, it can be rather hard to splurge on something that only provides sheer coverage and a little moisture. I'm more of a tinted moisturizer person and one of my all time favourites is the Laura Mercier Tinted Moisturizer which is quite the splurge. But, I've recently been loving the Maybelline Dream Fresh BB cream just as much. Its no BB cream, but a fantastic tinted moisturizer that I absolutely love. Both have a creamy consistency, the Laura Mercier one being slightly more thicker with a wider shade selection. 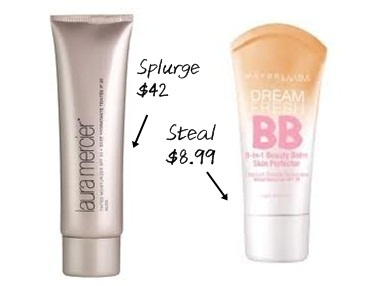 But, they are the perfect bases if you like the sheer, dewy look with some sun protection. I love them both. So, what are some of your tried, tested products that you have some affordable choices for? Do tell!